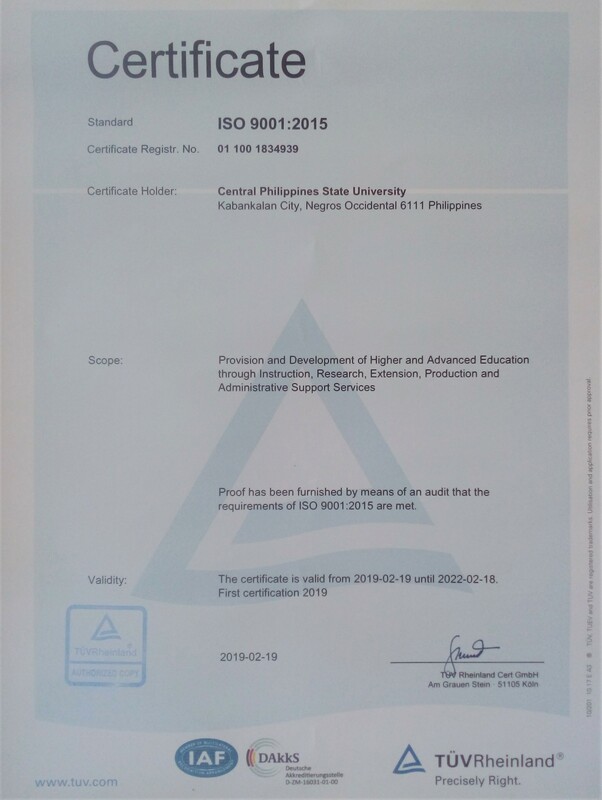 Central Philippines State University is now a certified member of the International Organization for Standardization (ISO). TÜV Rheinland Philippines Inc., a certifying agency under the international company TÜV Rheinland Group, awarded ISO 9001:2015 certification to CPSU effective February 19, 2019. This was after the conduct of two stages of audit on the university main campus on November 21, 2018 and on January 7-8, 2019. The scope of the Quality Management System of CPSU is the provision of higher and advanced education through instruction, research, extension, production and administrative support services. The university management, faculty and staff prepared for the accreditation by undergoing a six-month training conducted by the Development Academy of the Philippines from July 30 to December 6, 2018. The move to obtain ISO certification, is the university’s response to the implementation of the Government-wide Quality Management Program (GQMP) as mandated through Executive Order 605 (Amending for the purpose Administrative Order No. 161, S. 2006). AO 161, issued on October 5, 2006, institutionalized the Quality Management Systems in Government aims to effect actual improvements in public governance in recognition of the ISO 9000 series which ensures consistency of products and services through quality processes.